If you have uterine fibroids or have had them in the past, you should be checked by your doctor on a regular basis. Fibroids may be attached to the outside of the uterus or be located inside the uterus or uterine wall. A small number of pregnant women have uterine fibroids. If you are pregnant and have fibroids, they likely will not cause problems for you or your baby. Rarely, a large fibroid can block the opening of the uterus or keep the baby from passing into the birth canal. In this case, the baby is delivered by cesarean birth. In most cases, even a large fibroid will move out of the fetus’s way as the uterus expands during pregnancy. Women with large fibroids may have more blood loss after delivery. Often, fibroids do not need to be treated during pregnancy. If you are having symptoms such as pain or discomfort, your doctor may prescribe rest. Sometimes a pregnant woman with fibroids will need to stay in the hospital for a time because of pain, bleeding, or threatened preterm labor. 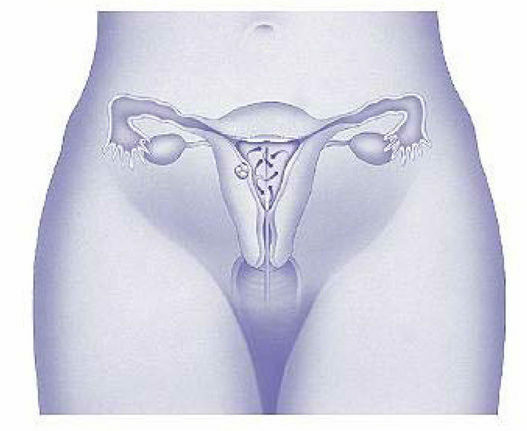 Very rarely, myomectomy may be performed in a pregnant woman. Cesarean birth may be needed after myomectomy. Fibroids decrease in size after pregnancy in most cases. Birth control pills and other types of hormonal birth control methods. These drugs often are used to control heavy bleeding and painful periods. A drawback is that this treatment may cause the fibroids to increase slightly in size. For some women, the benefits of hormonal contraception outweigh the risk of this side effect. Gonadotropin–releasing hormone (GnRH) agonists. These drugs stop the menstrual cycle and can shrink fibroids. They sometimes are used before surgery to reduce the risk of bleeding. GnRH agonists have many side effects, including bone loss, osteoporosis, vaginal dryness, and night sweats. For these reasons, they are used only for short periods (less than 6 months). After a woman stops taking a GnRH agonist, her fibroids usually return to their previous size. Progestin–releasing intrauterine device. This option is for women with fibroids that do not distort the inside of the uterus. It reduces heavy and painful bleeding but does not treat the fibroids themselves. In addition to these drugs, many others are being studied for the treatment of fibroids. Hysteroscopy can be used to remove fibroids that protrude into the cavity of the uterus. A resectoscope is inserted through the hysteroscope. The resectoscope destroys fibroids with electricity or a laser beam. Although it cannot remove fibroids deep in the walls of the uterus, it often can control the bleeding these fibroids cause. In most cases, an overnight stay in the hospital is not necessary. 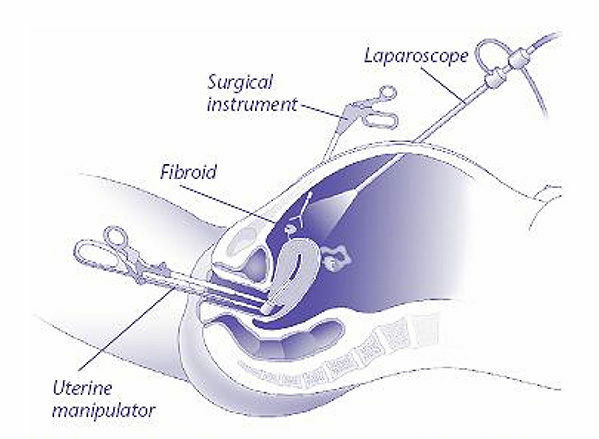 In myomectomy, fibroids are surgically removed. Shown here is a laparoscopic myomecotomy, in which small cuts are made in the abdomen. A laparoscope is used to view the inside of the pelvis. Other instruments are used to remove the fibroids. Other ways to perform myomectomy are with laparotomy or hysteroscopy. Endometrial ablation. For small (less than 3 centimeters) fibroids inside the uterus, uterine ablation may be an option. Shown here is one method that is used. A balloon is inserted into the uterus and is heated. The heat destroys the uterine lining, along with the fibroids. Uterine artery embolization (UAE). In UAE, small particles are inserted into the uterine arteries. 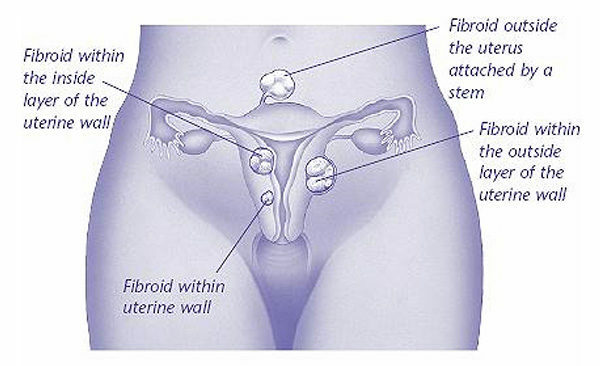 The particles stop the flow of blood to the fibroids, causing them to shrink. Hysterectomy. For very large fibroids that do not respond to other treatments, hysterectomy – removal of the uterus – may be done. If you have uterine fibroids or have had them in the past, you should be checked by your doctor on a regular basis. Getting regular checkups and being alert to warning signs will help you be aware of changes that may require treatment. Laparoscopy: A surgical procedure in which a slender, light-transmitting telescope, the laparoscope, is used to view the pelvic organs or perform surgery.